T@B_Speed -World record T@B: 230.97 km/h! At the Michelin Driving Centre to the north of Berlin one silver 'T@B' arrow had a date with a gorgeous silvery Porsche Cayenne Turbo. Not just a normal Cayene you understand. Oh no! But one that had been tuned like a proper car by the experts of TechArt. 510 HP under the Porsche's bonnet. And a T@B on the back!! The long awaited day finally arrived. Sticking to the racing line, adrenaline flowing, and sure enough a new world record. 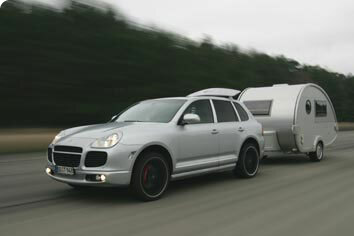 7 km/h faster than any car and caravan combination before, a stunning 230.97 km/h.